I haven't been here in so long! So long. But I've come back with some fun little fan comics made by the creator of the Manly Guys webcomic. 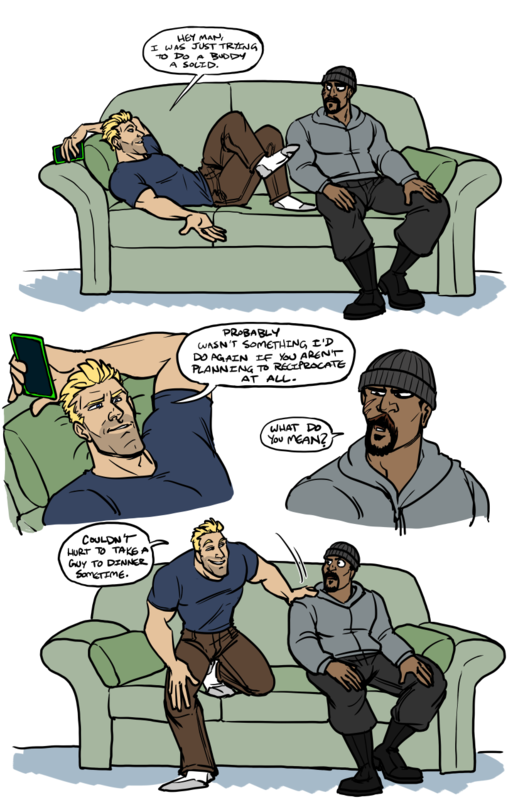 For anybody who isn't familiar with Overwatch, the comically intense super edgy dude is Reaper (or at least his past identity, Gabriel Reyes). The running joke is that his aesthetic is somewhere between 2003 Hot Topic goth and 90s buckles and belts comicbook antihero, and we all know him as an edgelord who takes himself just a bit too seriously. 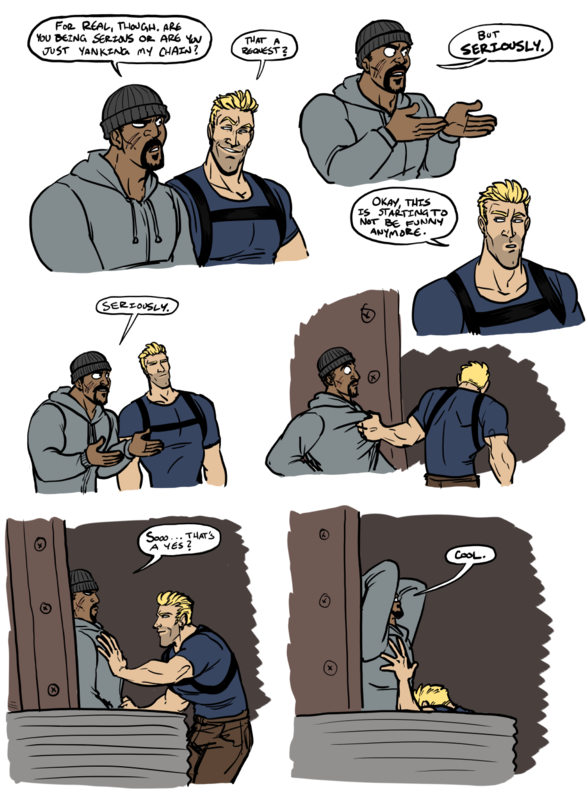 This is a shippy fancomic between his archnemesis™ and former colleague/friend/partner in worldsaving Soldier76, or Jack Morrison. It was supposed to be a twofer silly comic that coelasquid, the creator, just popped out for fun. It turned into an epic, 40-page love story with ridiculous jokes ala Manly Guys, with lots of fun sexual tension and "bros being bros" trying to confess to a deeper love beyond brohood. It's ridiculous, fun, absolutely worth the read, not just for the comic but also for the commentary coelasquid leaves in every page. It's an absolute joy and you will not regret reading it, even if you don't know a lot about Overwatch. ... so are they gay in the game? gay for play? lol seriously though... I know that that one sniper girl is a lesbian. is there also a gay character? Tracer is the only confirmed gay character (and she is not the enjoy, although Widowmaker WAS tracer's most popular pairing up until Emily appeared). Man, autocorrect gets weird sometimes. 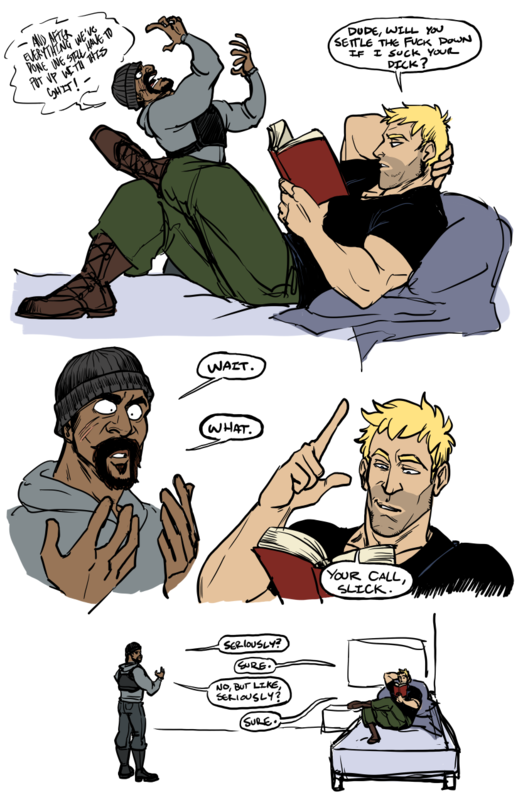 Yea, I totally dig this and McCree/Hanzo. Though I suspect when we get a gay male character (which I would bet is a matter of 'when'), like with Tracer it'll be a non-hero boyfriend. There is the matter that Hanzo's an assassin on the road of redemption, and Doomfist is active Talon! Lesse, known official relationships are, Tracer has a girlfriend named Emily, Widow had a husband before Talon got her and she became all Widow-y. Torbjorn has kids. Ana has an adult kid in Pharah and we might've seen Pharah's dad. Mercy and Genji might be into each other and have exchanged X-mas letters. 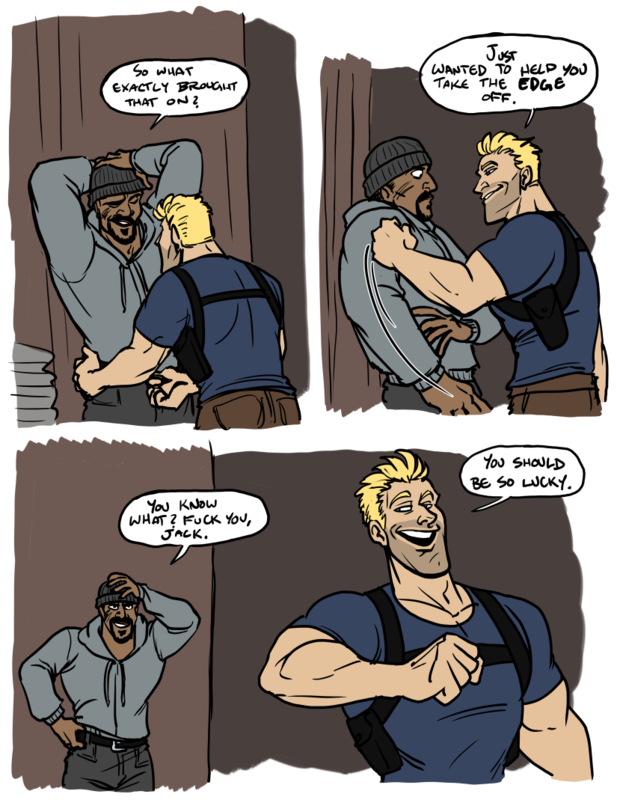 Common fancanon stuff are Jack and Gabe here being together. Hanzo and McCree being together. Mercy and Pharah are extremely common. Genji and Zenyatta (who in canon helped him find peace with himself and is sorta his master, but is younger than him). Some people think Emily is one of Torbjorn's kids. 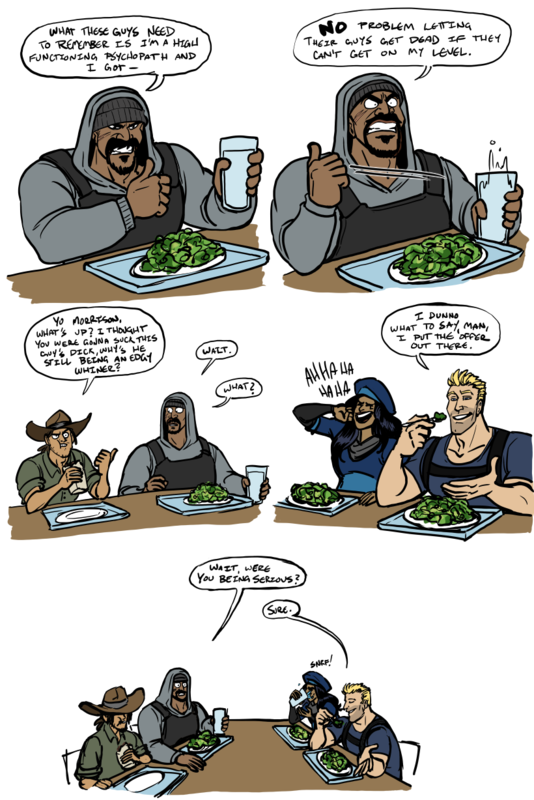 And it's also popular to think that Ana and Reinhardt have a current thing (they do get kinda flirty at times and it seems kinda unlikely that Ana's still with Pharah's dad for a couple of reasons, including faking her own death). There's other pairings beyond those, but I think everyone else is a bit softer and less set. And yes, the fan pairings do largely ignore the Genji-Mercy thing. This is because very few care for that one partially for gameplay reasons (i.e. in game, Mercy is likely to be hovering around Pharah, a deadly combo, or the heavy characters, while Genji is going to be halfway across the map saying 'I need healing' to the ire of Mercy players), and it came pretty late in the game well after Pharah/Mercy was etched into fan's minds (so was Widowmaker and Tracer, but it's easier to factor Emily in, Widowmaker makes a great 'jealous that Tracer's with a civilian' character and it confirms Tracer's sexuality. Or alternatively downplaying Emily since she's not one of the main characters). Come at me brah - Roadrat all the way! Ana's ex-husband and Pharah's father is an as of yet unseen soldier of Native American descent according to Blizzard (while trying to defend Pharah's totem pole skin). Yea. Which they might've had planned. On that skin specifically, There is this interesting defense by a native of that tribe. Who doesn't claim to speak for all and IMO one should always contact organizations of the group first, but in that light I think it's way better than Roadhog's Polynesian skin (where he's both not from that culture and it's a mish-mash of cultures rather than any specific group). And given that Polynesian culture in itself is a homogeny of today's existing Polynesian countries, I think it was a good choice to not have it represent any specific one, but still be clearly visually Polynesian. It'd make more sense to make it just Maori IMO... I mean, there is cross-polynesian stuff, Moana did a good job, but I understand it's more a mish-mash. Still, there's really no sign of cultural ties to that community, so... yea, I find it the iffiest. A culture isn't a costume and putting a culture's imagery on a white Aussie is a bit eeh. There's also Symmetra's Deva skin which has some complaints, but I've also heard some Hindus like it and she is flat-out Hindu, so yea. Seeing as no religion is specifically stated in the OW universe, Sym has never been confirmed as Hindu, but she's Indian and Indians are largely Hindu in terms of religious beliefs and adherence. She's not canonically confirmed Hindu, but it's logical progression. I also know for a fact as I've visited New Zealand that white Maori are very common (or specifically, mixed race New Zealanders with proud Maori heritage and white skin). And since we've never seen Hog's face in canon, we can't decide for sure he doesn't have that sort of a background. All that said, I'm more than glad to see Polynesian culture represented in Roadhog, something which allows people of that culture to claim him for their own. From the wiki: It is highly likely that Roadhog is of New Zealand Maori heritage due to his real name (Mako) and alternate skin titled "Toa" which is the Maori word for "Warrior". "Mako" is also the Maori word for "the shark" or "a shark tooth" which could explain Roadhogs shark headed alternate skins. So these details more or less strongly imply if not outright state that Roadhog has New Zealander and/or Maori heritage. I am a New Zealander or colloquially a "Kiwi" as per our national animal. Why I mention that will be important later. lands than from Hawaii. Look at where they are on a map and you can guess why. However the "Islander" skin in particular is dead on for looking like a Maori native of New Zealand as they typical have more tattoos and somewhat darker skin* than the other islanders. "But default Roadhog doesn't have any tattoos typical of any pacific islands." Well that's not quite true, New Zealand has a few major biker gangs who are predominantly Maori (which I would never hold against them, most of the gangs do a LOT of good community work). This is important because these gang members will often have a tradition tattoos on their face but have American style biker tattoos elsewhere on their body just like Roadhogs belly tat. Finally we come back full circle back to my first point. One of his common skins is called "Kiwi" which links heavily into New Zealand. It's our national animal, one of our biggest fruit exports and the informal name for us as a people. If we ever see his face we will likely find out one way or another. I did just now remember from this post that yes, quite a few Maori people, especially in biker gangs (there was a gallery showing portraits of them when I visited) have face tattoos, so it would be super interesting if Hog was hiding that under the mask. Yeah Torb, why DO you hate mental health?? I have no problem with shipping (I even occasionally indulge in the topic, myself),but I'm always so confused when people pair extremely antagonistic rivals as romantic interests with each other. For example, Widowmaker assassinated a figure that Tracer highly respected and smugly smiled when the latter tearfully demanded why someone would ever want to do something like that. What would they possibly see in each other? I don't personally ship Widowtracer specifically because of the Mondatta murder but I ship Reaper76 Or morreyeson because of their long standing history. 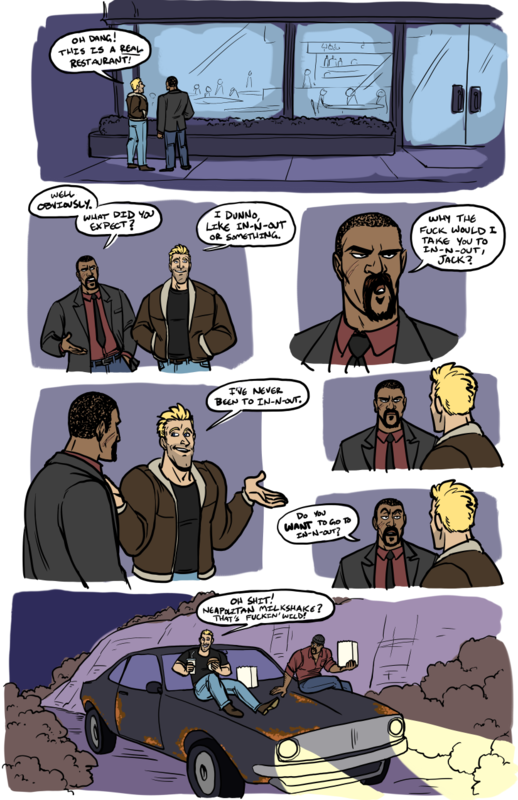 Together in the super soldier program, together fighting omnics in crisis, together as Co commanders after... Their relationship could have been anything between long time comrades, brothers, or life partners. Prime shipping material right there. I, too, loathe the "they're bickering/fighting/literally trying to murder each other, they must be in love!" trope--looking at you, Reylo--but I admit, I've seen enough of the Overwatch AWNN videos to get a little bit behind Widowtracer.